This is part of a series of introductory guidelines for software development. It’s a continuation of the previous post about Dependency Injection. One of the primary reasons to adopt Dependency Injection is that it is impossible to achieve a good layered architecture without it. Many developers argue that IoC container is only beneficial if you are doing test-driven-development. I disagree. I can’t quite think of how else you can build any layered architecture at all without IoC. First, let’s take a moment to define layered architecture. There is a common misconception about layered architecture, which is largely contributed by misleading diagrams in most textbooks and articles. This is how layered architecture often described in textbooks. I think that’s rather deceptive. Unfortunately, developers often take this diagram too literally. Each layer depends on the layers below it. Presentation layer depends on business-layer, and then both depend on data-access layer. There is a huge flaw in that diagram. Data-access layer should be at the outmost part of application. Business layer should be at the core! 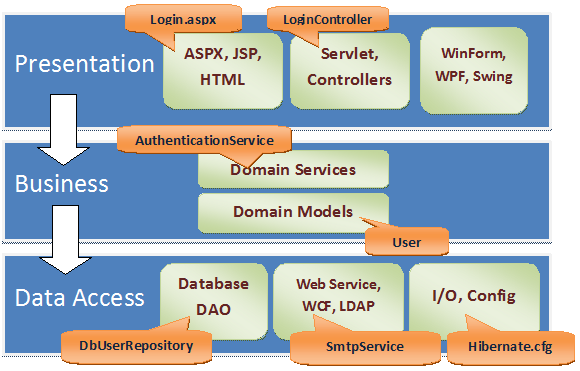 But in this diagram, Data-access layer is becoming the core foundation of the whole application structure. It is becoming the critical layer. Any change on data-access layer will affect all other layers of the application. Firstly, this architecture shows an incongruity. Data-access layer, in reality, can never be implemented without dependencies to business detail. E.g. DbUserRepository needs to depend on User. So what often happens is developers start introducing a circular dependency between Business layer and DataAccess layer. When circular dependency happens between layers, it’s no longer a layered architecture. The linearity is broken. Secondly, which is more important, this architecture tightly couples the whole application to infrastructure layer. Databases, Web-service, configurations, they are all infrastructure. This structure could not stand without the infrastructure. So in this approach, developers build the system starting from writing the infrastructure plumbing first (e.g. designing database-tables, drawing ERD diagram, environment configuration), then followed by writing the business code to fill the gaps left by the infrastructural bits and pieces. It’s a bit upside-down and not quite the best approach. If a business-layer couples itself with infrastructure concerns, it’s doing way too much. Business layer should know close to nothing about infrastructure. It should be in the very core of the system. Infrastructure is only a plumbing to support the business-layer, not the other way around. Infrastructure details are most likely to change very frequently, so we definitely do not want to be tightly coupled to it. Business layer is an area where you have the real meat of your application. You want it to be clean of any infrastructure concerns. Development effort starts from designing your domain-code, not data-access. You want to be able to just write the business code right away without setting up, or even thinking about, the necessary plumbings. One of the guideline in previous post is that we want classes within business layer to be POCO. All classes in business layer should describe purely domain logic WITHOUT having any reference to infrastructure classes like data-access, UI, or configuration. Once we have all domain layer established, then we can start implementing infrastructure plumbing to support it. We get all our domain models baked properly first, before we start thinking about designing the database tables to persist them. So this is a more accurate picture for layered architecture. Infrastructure sits at the top of the structure. Domain layer is now the core layer of the application. It doesn’t have any dependency to any other layer. From code perspective, Domain project does not have any reference to any other project, or any persistence library. 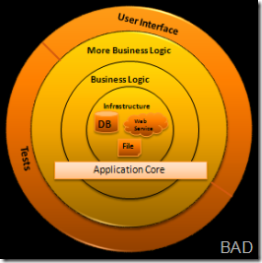 Databases, just like other infrastructure (UI, web-services), are external to the application, not the centre. Thus, there is no such thing as “database application”. The application might use database as its storage, but simply because we have some external infrastructure code in the neighbourhood implementing the interfaces. The application itself is fully decoupled from database, file-system, etc. This is the primary premise behind layered architecture. Alistair Cockburn formalizes this concept as Hexagonal Architecture, so does Jeffrey Palermo as Onion Architecture, but they truly are merely formalized vocabularies to refer to the old well-known layered architecture wisdom. In onion diagram, all couplings are toward the centre. The fundamental rule is that all code can only depend on layers more central, never on the layers further out from the core. This way, you can completely tear out and replace the skin of the onion without affecting the core. But you can’t easily take away the core without breaking all outer layers. In the diagram above, the infrastructure sits in the core of the onion. It becomes an unreplaceable part of the system. The structure cannot stand without infrastructure layer in the core, and the business layer is doing too much by embracing the infrastructure. 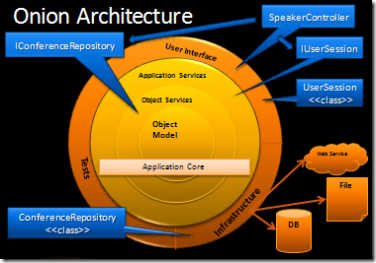 UI and infrastructure sits right at the edge skin of the application. They are replaceable parts of the system. You can take the infrastructure layer completely and the entire structure stays intact. Take a look at the diagram again. If you follow the previous post, we were building “resend PIN to email” functionality. AuthenticationService is in the domain layer at the core of application, and it does not have knowledge about SMTP client or database (or even where User information is stored). 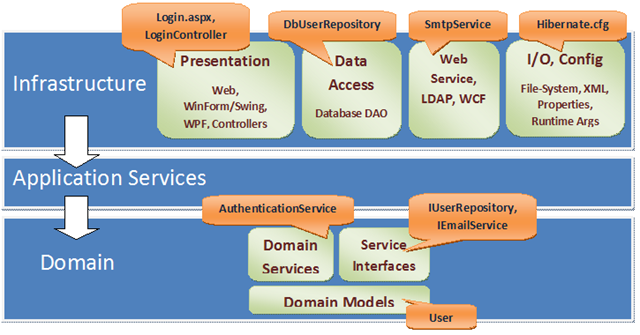 Notice that DbUserRepository and SmtpService are in outmost layer of the application, and they depend downward on the interfaces in the core (IUserRepository, IEmailService) and can implement them. Dependency Injection is the key. At runtime, IoC container will resolve the infrastructure classes that implement the service interfaces (IUserRepository, ICommunicationService) and pass them into UserAuthenticationService constructor. Every component depends only to the components in the layer below it. As you can see, the only project that has reference to System.Data and NHibernate library is Sheep.Infrastructure.Data. Likewise, the only project with System.Web.Services reference is Sheep.Infrastructure.BackEnds. And none of those infrastructure projects is referenced by any other part of the application (and this is enforced by Visual Studio). Therefore, they can be totally taken away and replaced without affecting the application core. On the flip side, the whole infrastructure layer is tightly coupled on the core layer. Domain layer is POCO. It does not depend on any other project, and it does not contain any reference to any dll for particular technology. Not even to IoC framework. It contains just pure business logic code. In order to be executed, this assembly has to be hosted either within a system that can provide infrastructure implementation, or within test system that provides mock dependencies. Hence notice that we have 2 versions of top-level skins in the structure: Infrastructure and Test. You can write domain code straight from the start without system consideration or waiting for infrastructure implementation. I.e. you don’t need a database at early stage of development, which is invaluable because you eliminate the overhead of keeping your database schemas in sync with domain models that are still shaky and keep changing every few minutes. The application core can be deployed for any client or any infrastructure, as long as they can provide the implementation for the service interfaces required by the domain layer. Basically, it all describes Single Responsibility Principle (each class should only have 1 reason to change). In the classic diagram, being tightly coupled to data-access layer, domain layer needs to change because of some changes in infrastructure details. Whereas in layered architecture, you can completely tear apart the infrastructure layer at the skin, and replace with arbritary implementation without even laying a finger on any domain class at the core. Thus there is only 1 reason the classes in domain layer need to change: when the business logic changes. Having said that, this architecture is not necessarily the best approach for all kind of applications. For simple form-over-data applications, Active-Record approach is probably better. It couples the whole application directly to data-access concerns, but it allows a rapid pace of data-driven development. However, for most non-trivial business applications, loose coupling is a very crucial aspect of maintainability. This whole post is actually an introduction to our next dicussion about Domain Driven Design in some later post. Hi Hendry! I am following these series enthusiastically! Your postings have a high quality and I really enjoy reading them. Keep up the good work! Very nice and informative series. If possible, can you adopt a step-by-step approach to the email app? It would really help us newbies in the IOC world ! Again thanks for taking time to do this. @Dicky, I probably wouldn’t go as far as to say diagrams in textbooks are incorrect. They merely describe *logical* layering of applications, and they should NOT be intepreted as how you should structure your code and dependencies physically. still waiting for part three. Please bare with me as I am really trying hard to get my head around this (new to IoC)! I am confused by this Project Structure for two reasons. 1) In the diagram, there is no arrow showing Sheep.Infrastructure.Web using Sheep.Infrastructure.Data. If the IoC mapping is done in the initialisation of Web, surely it must know about the DAL classes in Data in order to register them against Domain’s dependencies? 2) In order to keep all of Domain’s classes in a single dependency graph, wouldn’t Domain then need a class (E.g. DomainEngine) with a bazillion parameters for it’s constructor? For example, I may have persistance classes for each object, e.g. IPersonDb, IAccountDb, with methods like IPersonDb.GetPerson(personId). Accessing such a class might look like myDomainEngineFromContainer.MyIPersonStore. So, DomainEngine would have dependencies for at least as many classes as I have models. What am I missing? I wouldn’t group infrastructure with UI and SIL concerns. You may want to create two “blue boxes” side-by-side; one for infrastructure and one for UI/SIL implementations. Also, instead of Service Interfaces I would call this Domain Contracts. Thanks for the reference. I enjoyed your post. Dependency injection relates to a object configuration in which an external entity is set, on the other hand it is an alternative to have the object configure itself. Even I think one should apply this as without that good layered architecture is not possible. Great controversial article that makes one think about data access.